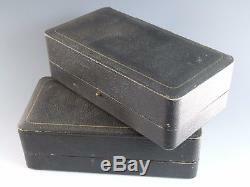 A pair of boxed sterling silver 3 piece condiment sets, comprising of pepper, salt and mustard. 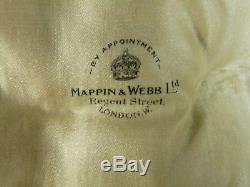 Made by premier silversmiths Mappin & Webb. Comes in the original fitted box. Please see above for quantity available. Price is for the set. 925 sterling silver, Birmingham 1943. All are in vintage condition, with a nice soft silver patina. Some damage to the blue liners - some chipping to 3 of the 4 liners. We are dedicated to ensuring the highest possible quality service to our customers, always going above and beyond! See the tabs below to read more about our policies. We are a one-stop shop for replacement quality named brand stemware, flatware and hollowware. We are a friendly team whom have established a reliable, quick and efficient service. Out of these hours it may take a little time to answer massages, but will always get back to you. We're often asked to send glass and cutlery to friends and relatives as a replacement for small accidents... Please let us know if you would like us to send the receipt somewhere else! Sadly we are unable to accept customer collections at this point. All items are cleaned and inspected before being dispatched; we only use the best packing materials to insure your item reaches you safely. 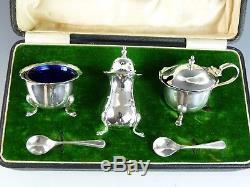 The item "Vintage Sterling Silver Pair MAPPIN & WEBB Condiment Sets" is in sale since Monday, October 9, 2017. 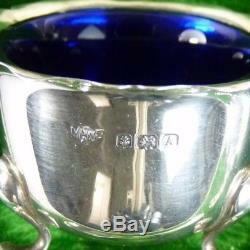 This item is in the category "Antiques\Silver\Solid Silver\Pitchers/Jugs". The seller is "merrittrobinson" and is located in Bexley.